Interested in learning more about the benefits of pollen? Evona from Gaughan Bee Dancin’ shares some helpful information. Read on! 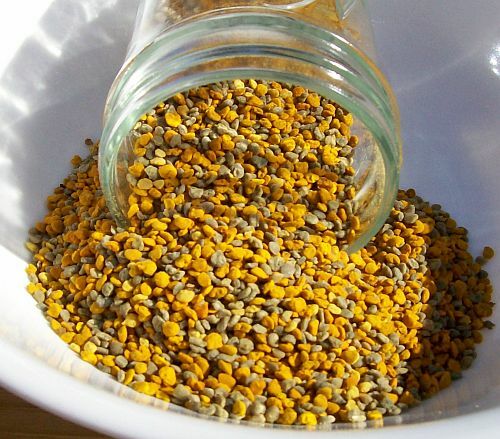 Bee pollen contains anywhere from 12% to 30+% protein. Also contains the complete spectrum of amino acids. They are the building blocks of proteins, which are needed to build every cell in the body. Pollen contains every vitamin known to science. It is especially rich in pantothenic acid (B5), nicotinic acid (B3), and riboflavin (B2). Also contains vitamin C, calcium, copper, iron, magnesium, potassium, and manganese. More than twenty five trace elements account for 2 to 4% of the dry weight of pollen. Not a significant source for vitamins B12 and D.
Pollen is 5 to 10% good fat by dry weight. This contains considerable essential fatty acids, lecithin, and other nutrients. They are “essential” because we need them to survive, and the body cannot produce these by themselves. It is recommended that other sources of EFA’s are also used, such as flax oil or hempseed oil. Pollen is rich in phytochemicals, which are a plant’s natural immune system, warding off diseases and viruses. These increase a body’s immune system and support the ability to remove toxins. These substances have also been linked to the prevention of cancer, heart disease, diabetes, high blood pressure, and other ailments. People who don’t get any benefits from vitamins often are able benefit from pollen because it is a natural food and is absorbed into the body more readily than some brands of vitamins. Fresh, unheated pollen contains numerous active enzymes, coenzymes, and hormones. Enzymes are energized protein molecules and are used in every biological process in the body. Eating enzymes saves the body from the energy depleting process of manufacturing enzymes. Pollen is a complete food source. Rats and mice fed unlimited pollen and water grew up with heavier brains, and weighed three to four times less than a control group fed standard lab chow. They were fed this diet for over a year and led healthy lives. One or two teaspoons of pollen is equal to a hearty serving of vegetables. Start off with a few granules at a time to determine if you have allergies and work your way up to one to three tablespoons a day. Animals consume more bee pollen in the U.S. than humans do. Your pets can benefit from this supplement that isn’t found in most commercially available foods. Birds, cats, dogs, rabbits, ferrets, and other small mammals love pollen. Detoxifying and healing properties of pollen have been known for years. It alleviates allergies, fatigue, high cholesterol and triglycerides, infertility, impotence, varicose veins, prostatitis, cancer, and helps recovery from illness and surgery.